It’s been an exciting week in the normally staid world of drug safety. Last Thursday, FDA launched a public dashboard for FAERS (the FDA Adverse Event Reporting System). We’ve been calling on FDA to do this for years, so we were quite excited to read the news and take the new dashboard out for a spin. Apparently, a lot of others were just as excited. The site almost immediately stopped working and stayed that way for most of Friday. More troubling was the unanticipated effect on the public stocks of a number of biotech companies. Market actors apparently started trading on Friday based on what they were seeing in the new FAERS dashboard (death reports in particular). They wreaked so much havoc that stock prices dropped significantly, Wall Street analysts had to try to calm investor fears and the story became a major talking point on business news channel CNBC. The events surrounding the launch of the new FAERS dashboard were so extreme that FDA Commissioner Scott Gottlieb felt compelled to issue a second statement on Monday morning reiterating that FAERS data has a number of limitations and really shouldn’t be relied upon to make investment and trading decisions. Wow. Talk about going from 0 to 60 in under 4 seconds – that’s more action than we’ve seen in the drug safety world in the past few years combined! Fortunately, it appears things have now quieted down. Stocks affected by the “FAERS Panic” have largely recovered and the public dashboard appears to be accessible again. So, what of the dashboard itself? It’s fine. It has a nice user interface and decent search capabilities. The data themselves aren’t nearly as clean and intuitive as they should be, but hopefully FDA will fix that in due course. But it seems to serve the stated purpose of giving patients and healthcare providers a better view into what is being reported to FDA. We’ll have to see how the manufacturers respond to the increased attention paid to FAERS by patients and healthcare providers in the coming months. 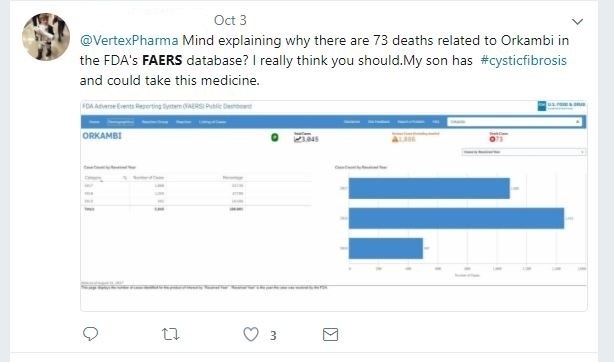 Our support of a public interface for FAERS data is rooted in the belief that the more patients and healthcare providers know about FAERS as a resource, the more they will report adverse events to FDA and phamaceutical companies. FAERS reporting has grown dramatically over the past few years, due in large part to more people becoming aware of the data. We hope that this public dashboard will help to continue this trend. For drug safety professionals and other enterprise users, the public dashboard is insufficient – it doesn’t properly aggregate cases under unique drug names, it contains millions of duplicate cases and outcomes, and doesn’t include any meaningful statistical analysis. For those looking for the next generation in enterprise level pharmacovigilance tools, please feel free to get in touch. See more on the FDA Adverse Event Reporting System in our comprehensive guide to FAERS.